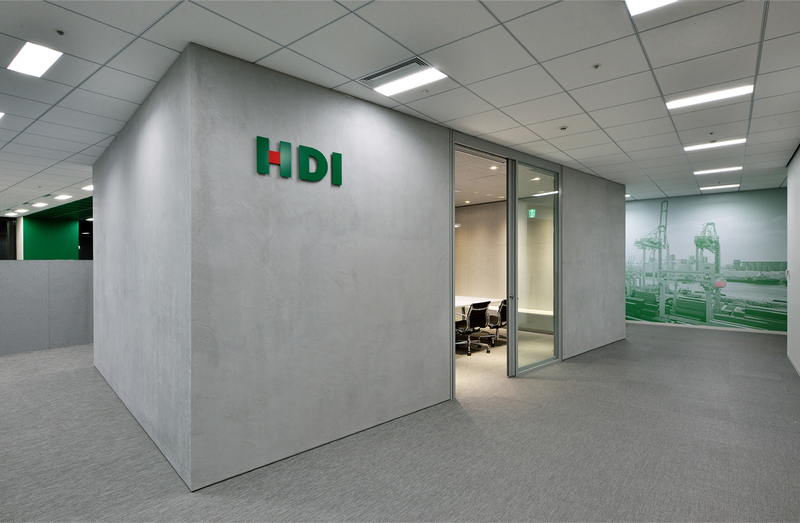 HDI - a search for an authentic experience at work. What does an authentic workplace look like? Designing an authentic officeis not an easy task. Just like the terms “artist”, “poet” or “greatlover”, these are titles that are given or need to be earned rather thanbeing self-assigned. Our attempt in creating an authentic workplace started off with ourWorkVitamins methodology. This methodology was created by me, Martin vander Linden, principal of van der Architects, when I was an assistantresearcher at Waseda Univeristy in 2001 here in Tokyo. I believes thatarchitecture can be a catalyst for change in innovative environments, andthis methodology - called “WorkVitamins” - is based on this idea. The methodology has four steps. The first step is called INITIATE andsets the tone of the direction of the project by creating a SharedWorkplace Vision. 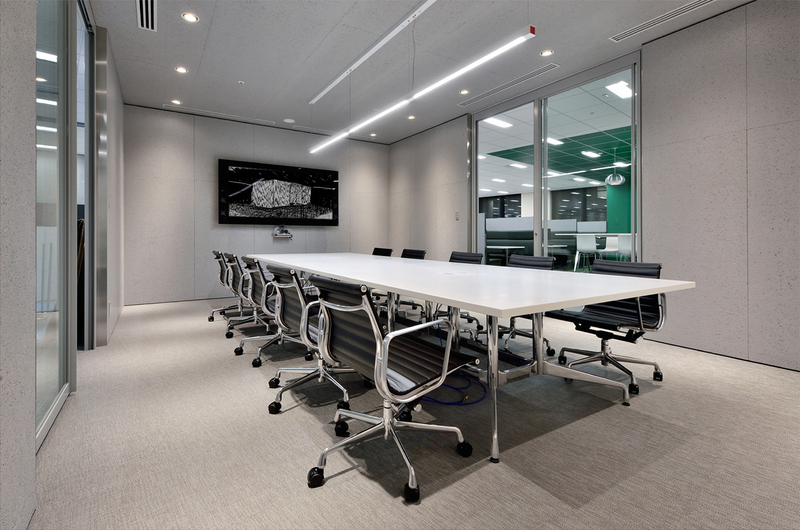 For the HDI project the vision was to create a workenvironment where we would deconstruct the idea of an office as a staticspace with fixed seats. This might sound like nothing really new as Free-Address or Hot-Desking has been around for maybe over two decades. Wewanted to create a work environment in which there would be specificspaces that during the course of a work day would support the specific,changing tasks of the employees. Thus during the second phase of ourWorkVitamins methodology, called ANALYSIS, through questionnaires,observation and follow-up interviews we started to be able to understandthe various, very specific, working-space needs that the employees of HDIhad. 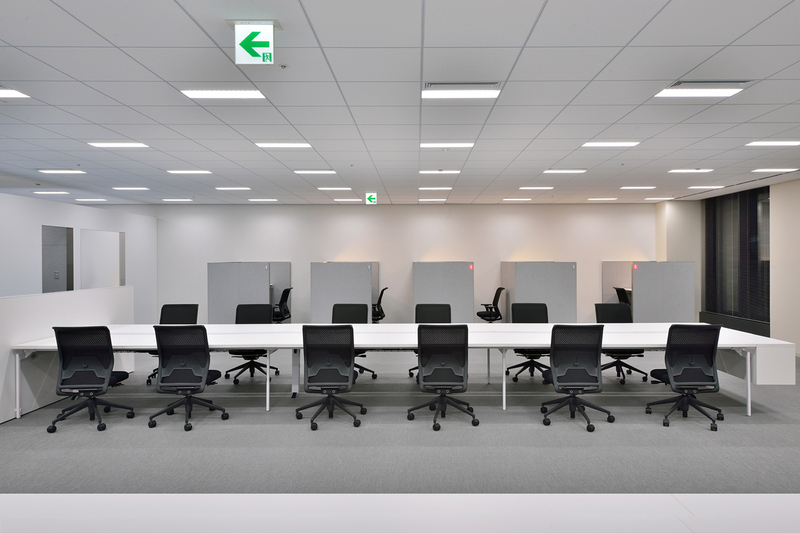 This enabled us to formulate a new set of spaces that would allowthe employees to perform their changing tasks through-out the day. Inthis way the employees are constantly moving through the workspace,letting the nature of their tasks decide which seat would support theirtask best. 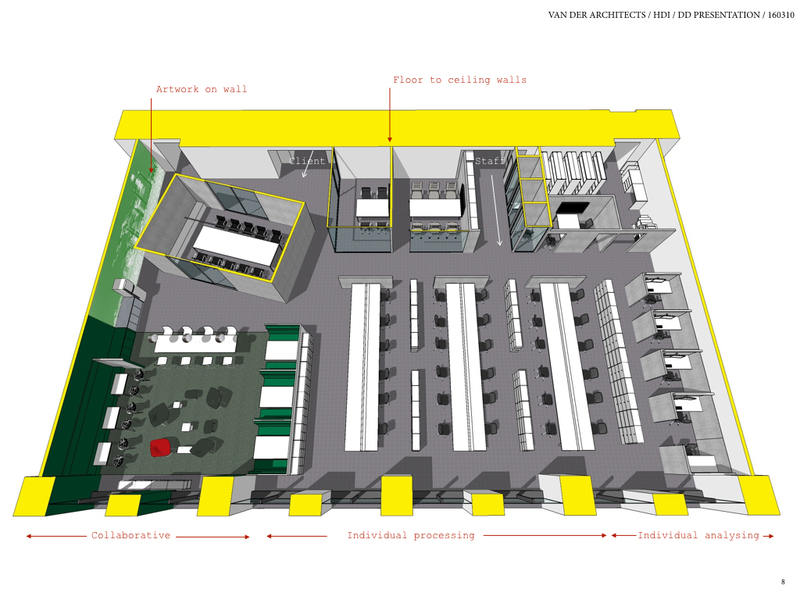 Thus we created four distinctive zones with a diverse set of spaces forspecific tasks ranging from individual to group work, and fromconcentration to collaboration. light in front of these booths acts as a simple reservation system. 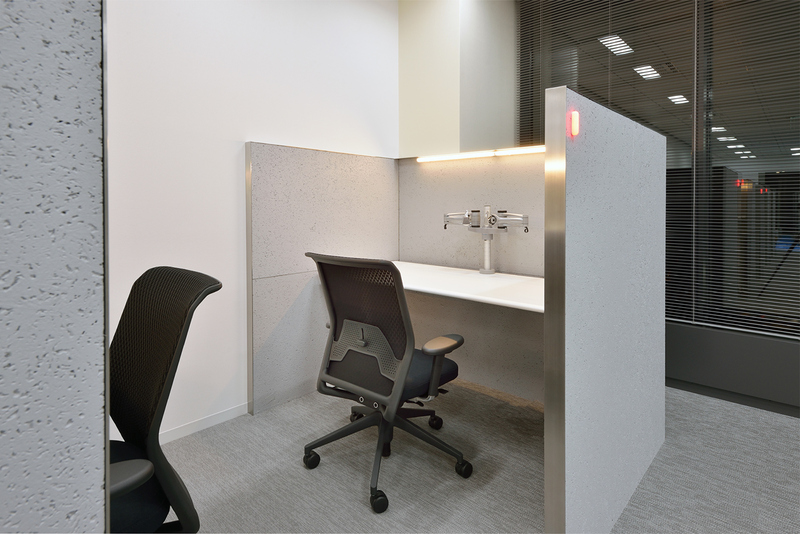 Thebooths feature double flat-screens and are used by the staff for writingreports, preparing payroll, or document review. One of the booths hasback to back seats for collaborative work. In the centre of the space we placed three large worktables. These tablesare mainly for individual processing-type of work which requires littleinteraction with other staff nor concentration. To the left of the space is a collaborative area. 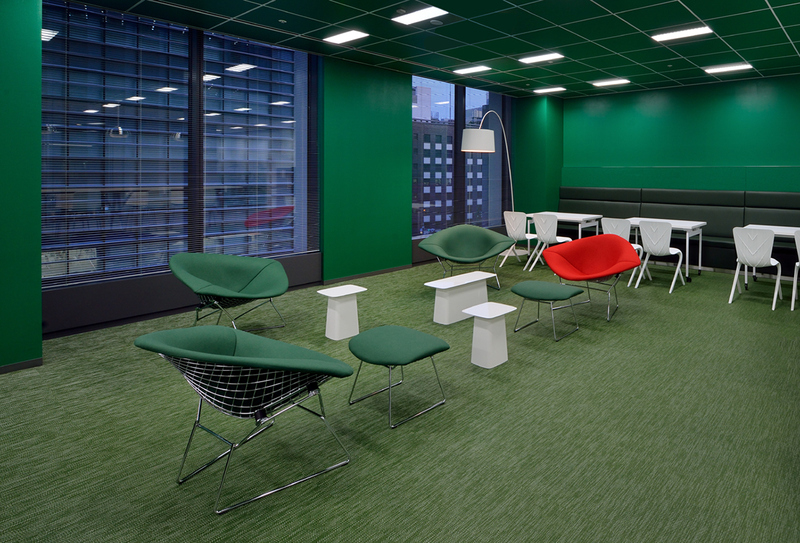 Most of the office isin a neutral white-grey colour palette but the collaborative spacedeliberately been coloured in green, with green walls, a green floor andgreen ceiling. A mix of seating gives the employees the choice to eithersit individually in comfortable sofa’s, or in small groups either alongthe back wall on a bench with chairs in front of them or in dinner-typebooths that can accommodate four. There is also a higher counter withstools which are very popular for quick meetings. 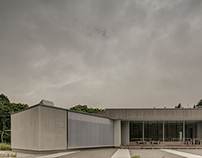 A client meeting room in a 3/1 proportion defines the client entrancespace. Placed under an angle it points on the left towards a glassmeeting room, while narrowing towards the right where it cuts off theview of a pixelated full height wall-print which continuous behind itinto the collaborative area. 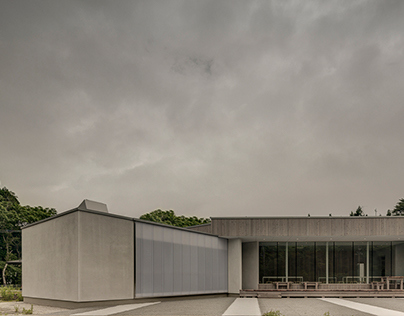 The client meeting room is clad in Mortexconcrete. 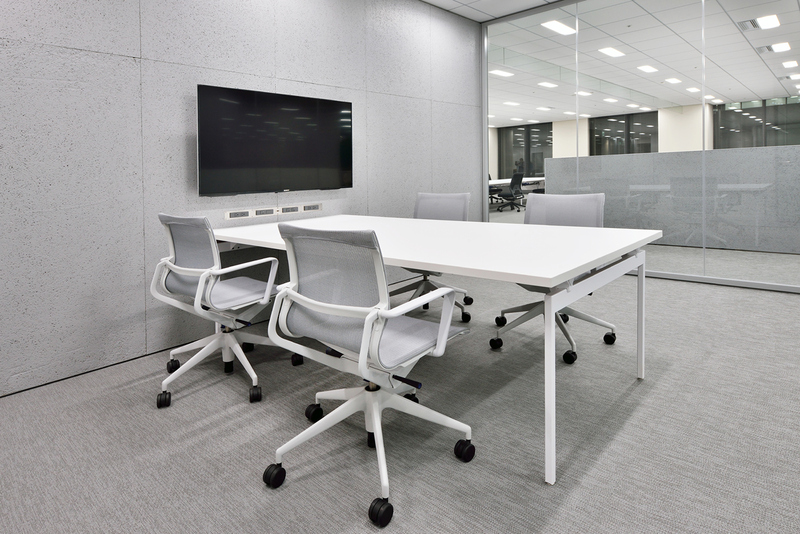 Glass doors on both sides allow for views as well as accessfrom the meeting room into the collaborative space. Two more smallermeeting rooms are placed close to the client entrance. At the other entrance staff are small lockers and coat closets. Threewell-insulated phone booths are placed in front of the lockers. Aroundthe corner there is a semi-enclosed team meeting room for teams workingon projects. design by itself means nothing. As the architect it is not up to me to say that the users are having authentic experience in this office but the combination of understanding the need for a diverse work setting in combination with a strong conceptual vision of how people can rather than should work might contribute to some sort of authenticity at work. Post scriptumThe photographer of this project is Yo Masunaga. Yo’s father was a famousgraphic designer, best-known (at least by anyone in Japan) for thecreation of the Peko-chan mascot for the Fujiya chain restaurants.Although Peko-chan looks like a girl with pigtails, it seems that theMasunaga senior based Peko-chan on his son Yo, our photographer (now inhis sixties).